The year's fullest moon occurs at mid-autumn, the 15th day of the 8th lunar month. None of the handbooks has any commentary, so the origin of the melody and its connection with the mid-autumn moon are uncertain. Mid-Autumn is also associated poetically with Peaceful Evening (liang xiao), as in a poem by Duan Keji. 78.381 has only 中秋 zhong qiu: mid-autumn. QQJC VIII/95. For further information on shang mode see Shenpin Shang Yi and Modality in Early Ming Qin Tablature. The versions/editions are all almost identical. 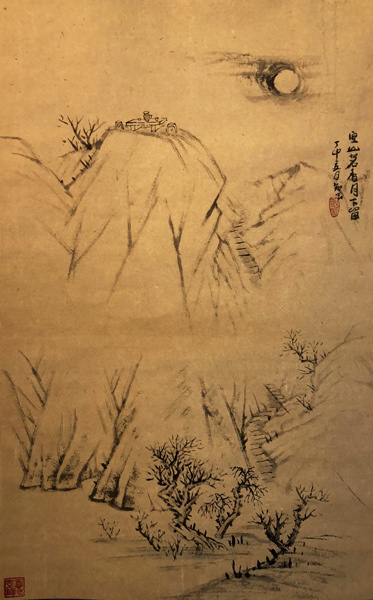 The experience on Huang Shan was a good example of the lesson to be learned from a story originally told in connection with the most famous qin master of antiquity, Bo Ya, about the qin and nature. These are translated and discussed in Michael A. Fuller, The Road to East Slope; Stanford U. Press, 1990; pp.237-8. In all there are four such poems written in 徐州 Xuzhou during the mid-autumn festivals of 1077 and 1078. The one written in 1077 follows the (7+7) x 2 syllabic pattern of Wang Wei's famous Yang Guan poem originally called Weicheng Tune. My translation of Su Dongpo's poem, as follows, goes word for word: 暮雲收盡溢清寒。 Mu yun shou jin yi qing han. 銀漢無聲轉玉盤。 Yin Han wu sheng zhuan Yu Pan. 明月明年何處看？ Ming yue ming nian he chu kan? Sunset's clouds gather together, flowing pure and cool. The Milky Way, making no sound, circles the Jade Dish (the moon). This life, this evening: it cannot always be so good. The bright moon: next year, from what place will I see it? The Chinese syllables fit exactly the note count of the four phrases of the harmonic section opening Zhongqiu Yue, meaning the poem could be used as lyrics for Section 1. Such a practice can be found in at least one other Ming dynasty handbook but there is no record of this ever having been done with this melody. On the other hand, the compiler of this handbook is said not to have liked lyrics with melodies, and so it is possible that if there did exist a sung version of this melody, or part of the melody, it was deleted from his handbook. In any case, when I made the recording linked here i was not aware of the possible connection: now to sing it I must change some of the note values in my interpretation. Several years earlier Su Dongpo had also written a mid-autumn poem in 密州 Mizhou (eastern Shandong province) using the cipai called 水調歌頭 Shui Diao Ge Tou; in 1618 this poem was used as lyrics for a qin melody in that pattern (see in its ToC). That version is written for a one-string qin; here there are more settings of these lyrics using that pattern with melodies for standard seven string qin. In discussions of rhythm and the qin I have often used this piece to demonstrate my opinion that many qin melodies have a basic, perhaps straightforward, structure, but that what gives the melody its art comes from freely interpreting that structure; in this way it is similar to the relationship between the standard form of a Chinese character and the way that form is expressed by a calligraphyer. To make this more clear, first I play the piece through more rhythmically and a bit faster than on the recording linked above. People can hear that it is a simple but lovely melody. Then I play it more freely, as above. Many people if they hear only one of the two versions prefer the rhythmic one: easier to "understand". However, most people who hear both seem to prefer the more freeling interpreted one: it fits better with watching, or imagining watching, a still, full moon on a cool quiet evening.